I’ve started my Classics Club Spin book, He Who Whispers by John Dickson Carr. Set not long after the Second World War end this is a ‘locked room’ type of mystery, in which the body of Howard Brooks is found, stabbed to death, on the top of a tower, but the evidence shows that no one entered or left the tower during the time the murder took place. And I’m still reading Wedlock: How Georgian Britain’s Worst Husband Met His Match by Wendy Moore, non fiction about Mary Eleanor Bowes who was the richest heiress in 18th century Britain. She fell under the spell of a handsome Irish soldier, Andrew Robinson Stoney and found herself trapped in an appallingly brutal marriage. Fascinating reading that if it was fiction you’d say you couldn’t believe it. The Story Keeper by Anna Mazzola, which was published on 26th July 2018. See yesterday’s post for the opening paragraphs and synopsis. It’s beautifully written and as I like folklore and legends, with a mystery interwoven within it, I’ve been enjoying this very much. I’ll post my review in the next few days. 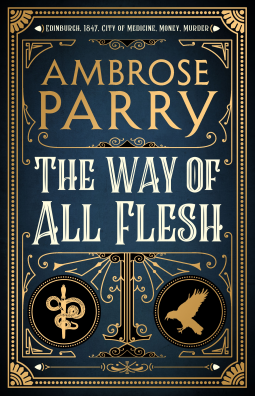 The Way of All Flesh by Ambrose Parry, co-written by best-selling crime writer Chris Brookmyre and consultant anaesthetist Dr Marisa Haetzman, to be published on 30 August 2018. Simpson’s patients range from the richest to the poorest of this divided city. His house is like no other, full of visiting luminaries and daring experiments in the new medical frontier of anaesthesia. It is here that Raven meets housemaid Sarah, who recognises trouble when she sees it and takes an immediate dislike to him. She has all of his intelligence but none of his privileges, in particular his medical education.